Jermaine Marshall had 27 points, just two shy of his career high, while making seven 3-pointers in ASU's 76-62 win over Texas Tech at Wells Fargo Arena. TEMPE, Ariz. — It is not completely accurate to say Jermaine Marshall chose Arizona State over North Carolina and Florida State only because of Jahii Carson. But when the two played pickup games together at Weatherup Center during Marshall’s visit over the summer, the chemistry seemed apparent. So did a realization that one could help the other. Brothers in arms, Carson and Marshall turned one and one into three on Saturday, when they combined for 43 points and 15 assists to help ASU to a 10-2 start with a 76-62 victory over Texas Tech at Wells Fargo Arena. Carson had his second career double-double — 16 points and a career-high 13 assists — and Marshall was the prime beneficiary, making a career-high seven 3-pointers en route to 27 points, two short of his career high set while he was at Penn State. "That’s what I was hoping," Marshall said of the type of 1-2 punch featured Saturday. "I knew he was a great point guard. When I was being recruited, they talked about Jahii. I finally got to see how hungry he was and how dedicated to the game he was, and I wanted to join that." Make no mistake: ASU knows what it has in the pair, and it knows how to use them. Marshall is almost always stationed on the right wing or the right baseline in the Sun Devils’ offense, so if/when Carson is swarmed when he uses his exceptional quickness to penetrate to the basket, he can find Marshall out of the corner of his eye for what can be, and often was Saturday, an open look. Carson assisted on six of Marshall’s 3-pointers and on seven of his 10 baskets. "We put him on the right side on purpose, so when I drive and I go to the basket and start knocking down a few, then they have to help off," Carson said. "He’s gong to put it up. He’s a taller guard. He’s got a quick release. The contests really don’t bother him too much." Carson had five assists when ASU led 34-25 at halftime, and it led to this conversation coming out of the huddle before the start of the second half. "I said I had eight (assists)," Carson said. "I can get you 10 for sure," Marshall responded. "I really don’t want 10, I want about 12," Carson said. "I’ll try to get you 12 then," Marshall said. It sounded like a mandate. "So I kept looking to him," Carson said. "I wanted 15, but I’ll do with 13." Carson had eight assists in the second half, when he tied his previous career game for a full game, which he had accomplished six times. It was his second double-double; he had 22 points and 10 rebounds in a victory over Detroit in the NIT last season. Carson was the only player in Division I averaging at least 19.9 points and five assists while shooting over .500 from the field entering weekend games, but scoring isn’t everything. "Actually, I really prefer to throw the dimes (assists)," he said. "I like to score as well, but when my teammates are hitting shots, it takes that much more off of me. I can play more defense. I can help the bigs on the boards. When those guys get going, it’s much easier. My quickness helps them get their shots off, and when they knock them down, I think we are tough to beat." Marshall, a 6-foot-4 senior who was able to transfer for a final year of eligibility after finishing his degree work at Penn State, went 6 for 10 from 3-point range against No. 4 Michigan on Feb. 27, when he scored 25 points in the Nittany Lions’ 84-78 upset at home. His career high of 29 points came against Michigan State last Jan. 16, and he had 27 against Michigan on March 4, 2012. "It’s confidence," Marshall said of the key to making 3-pointers. "Coach Herb gives us the freedom to shoot them, but on the other hand, he has us in the gym putting up extra shots after practice. We look for each other. We find each other on the perimeter and we knock them down. Jahii found me at the right time. I was in rhythm and I was able to knock them down. Credit goes to him. The 3s felt open." Marshall had five threes and 20 points in the second half, and his 3-pointer off a Carson feed with 13:48 remaining gave Arizona State a 50-37 lead. Texas Tech (7-5) never was closer than seven, and the Sun Devils led by as many as 17. "On his visit, I think it was important for Jermaine that Jahii was here. I think that had a lot to do with him wanting to come here, to play with a point guard like that," ASU coach Herb Sendek said. "And I think it has been really good for Jahii, because as great as he is, he doesn’t want to ever feel like he has to do everything himself. Good players want to play with other good players. The law of reciprocity." The discrepancy in 3-point shooting was a telling factor. Arizona State made 10 of 19 from behind the arc while Texas Tech was just 1 of 13. The Red Raiders averaged almost five 3-pointers a game coming in and went 6 of 10 against LSU in their last game. "Offense is like a girlfriend. One night it’s there, one night it’s not," said forward Jordan Tolbert, who had 25 points and Texas Tech’s only 3. 0 — turnovers by Arizona State in the first half; the Sun Devils finished with seven. — Big man Eric Jacobsen took four stitches above his left eye after receiving an elbow on a play under the basket late in the first half and did not return. ASU went small after Jordan Bachynski picked up his third foul on the first possession of the second half, but when Texas Tech scored three quick baskets underneath, Bachynski returned to stabilize the middle. Bachynski has 12 points, eight rebounds and seven blocked shots. — Junior Brandon Kearney entered with 10:22 remaining in the first half and played four scoreless minutes in his first game for the Sun Devils since regaining his eligibility at the end of fall semester. 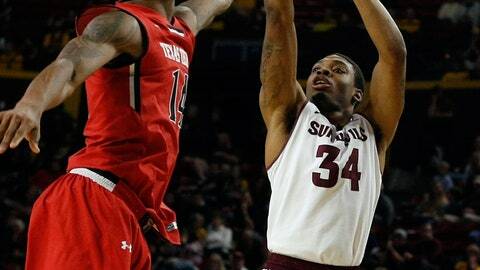 Kearney, 6-foot-5, will be used as a 2 or 3 (a big guard or small forward) in ASU’s system. –Marshall became the first Sun Devil to make seven 3-pointers in a game since Ty Abbott and Rihards Kuksiks did it weeks apart in 2011. The school record is 10, set by Stevin "Hedake" Smith. — Jahii Carson’s 13 assists were the most for an ASU player since Ahlon Lewis had 14 against Southern California on Jan. 3, 1988. Carson had 13 assists when he played at Phoenix Mountain Pointe in high school. Although Herb Sendek and Texas Tech coach Tubby Smith go back to their time together as assistants at Kentucky under Rick Pitino for two seasons in 1989-91, they met for the first time on an opposing sideline Saturday, even though Smith has been a head coach for 23 years and Sendek for 21.